Lozenges or troches are a popular dosage form used to keep drugs in the mouth when local action is desired. They also can be placed under the tongue and allowed to dissolve for sublingual delivery, which allows the medication to enter the bloodstream quickly and easily. Lozenges and troches can be enhanced with natural sweeteners and pleasant-tasting flavors, making them ideal for geriatric and pediatric patients. As many patients often have a difficult time taking medicine, a number of dosage forms can be custom-prepared for easier ingestion. Many medications can be taken through a flavored lollipop or a frozen popsicle. Others can be taken as chewable “gummy” treats. Infants especially benefit from alternate delivery devices such as pacifiers or baby bottles, which are wonderful for dispensing medicine easily and accurately. 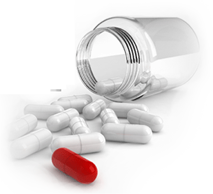 Medication can be compounded into individually customized capsules especially in cases where an alternate strength is required or in order to omit potential allergens or irritants. To reduce the number of doses to be taken, multiple medications often can be combined into a single dosage form or made into delayed-release capsules. Transdermal methods of delivery are also widely used because they allow the absorption of medicine directly through the skin. Gels, emulsion creams, sprays and lip balm stick applicators are easy to use and are effective in getting medicine into the bloodstream quickly. Frequently, transdermal medications are prescribed for pain management, inflammation, and nausea/vomiting. In many cases, transdermals are used to help avoid potential side effects such as upset stomach or drowsiness. Many medications are not available in liquid form for those patients who have difficulty swallowing tablets and capsules. Other patients may have problems tolerating the taste of a commercially available liquid. Through compounding, a pharmacist can make a naturally sweetened, pleasant-tasting oral solution or suspension that can be administered easily and accurately. Solutions and suspensions are also used in compounding eye drops, ear drops, sterile injections or nasal sprays.